Welcome to Woof Wednesday. Please meet some special dogs from MS, NJ, NY, TX and VA all in need of good, loving homes. 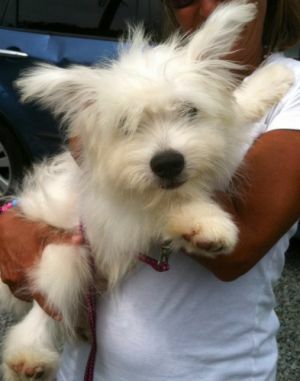 This is Rufus he is a 4 month old westie mix. Rufus is almost 20 lbs and not expected to get much bigger. Rufus is friendly to all. Rufus is being trained to potty outside. Raggetty Anne is a happy little girl. Her days in the mill has left it's mark and she still startles easily. She sleeps on the bed each night and enjoys her furry friends here. She is very silly and playful and shakes her little head at me when I tell her it is time to come in..she especially does this if she is not ready: She is potty trained. Needs a fenced yard. Walks on a leash fairly well but has a startle reflex. She is a Westie Poo that is a doll of a dog in every sense. She smiles, she is playful, she is quick and energetic. She only has a few teeth left and she does drool.making her face always look dirty. She is a high flight risk as she does still startle easily and will bolt. She needs a securely fenced yard and a quieter, no child home. She is a work in progress..but a very special munchkin of a dog. You can't look at her for long and not laugh and smile. She is healthy as far as we know and she is fully vetted. She is also potty trained and uses a dog door when I am home. She is about 12 pounds and she is 11 years old and still looks like a baby! Please this dog has been looking for a home for awhile now let's find her that special home and love she needs! 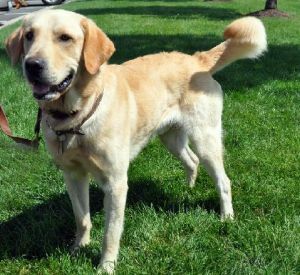 Cooper is a golden retriever-lab mix who is between 1 and 2 years old and around 55 lbs. He is neutered and is current on vaccines, heartworm preventative, and flea/tick protection. He was given up because he was too energetic for a mother with young children. He is good with other dogs, crate trained, and seems to be housetrained. Cooper is good in a crate, but he is young and will need plenty of exercise, stimulation, and some basic manners training that he didn't get when he was younger. Cooper is an awesome dog so lets find him a home to match! 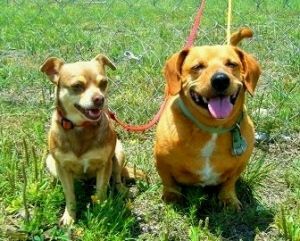 Cookie (Chihuahua mix, approx 6 yrs old) & Copper (Dachscund mix, approx 8 yrs old) were surrendered to the shelter because their owner said he did not have time for them anymore. Can you imagine being given up for a reason like that? They are both housetrained and they are both very loving and sweet. They would make wonderful pets/companions for some lucky family. Lets find these two sweethearts a home in which they can go to together! 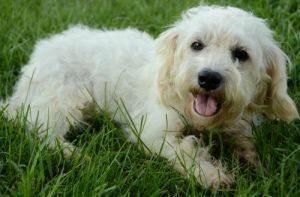 Rover is a young adult neutered male poodle mix that weighs approximately 15 - 20 pounds. His hair was dirty and matted and he was completely covered with fleas when he arrived at the shelter, but a few baths and a couple of weeks in a foster home have him looking and feeling much better. His adoptive family will need to have him groomed frequently and he will need to primarily live indoors or have a summer cut so that his hair does not become extremely matted again. He may have been intimidated or possibly physically abused in the past and he is a little cautious, but he warms up to new people quickly and he loves to get lots of attention from the people around him. He is also very social with other dogs. He follows the lead of the cats around him if they stand still he is gentlemanly and respectful, but if they run he does not mind joining in a chase. He can use a dog door and is doing well with his house training and while not completely trained, he definitely prefers to potty outside whenever he has free access to. He just needs to find a good home and a family who will give him the love he deserves!